SAN FRANCISCO -- Johnny Cueto struck out nine over seven innings for his team-leading 10th win, and the San Francisco Giants completed a sweep of the Milwaukee Brewers with a 10-1 victory Wednesday. Buster Posey hit a bases-loaded, two-run single in the third to get things going on a big offensive day, and Matt Duffy followed with an RBI single against Jimmy Nelson (5-6) as the Giants used a balanced offensive attack on the way to their fifth straight win. Four Giants had three hits to help NL West-leading San Francisco (41-26) move a season-high 15 games over .500. 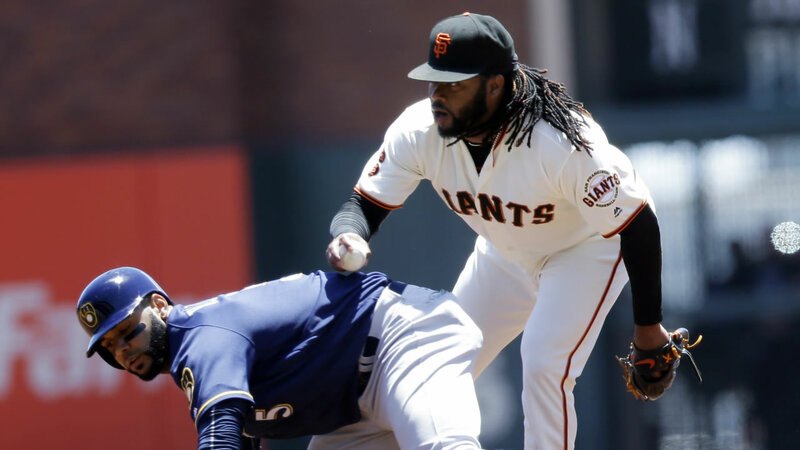 Brewers nemesis Cueto (10-1) won his eighth straight against the Brewers, seventh consecutive decision overall and the Giants improved to 12-2 in his outings, including April 5 at Milwaukee. Cueto, who pitched for the Cincinnati Reds in the NL Central, is 11-3 in 20 career starts against Milwaukee. After a season-best four-hit night in Tuesday's 3-2 win, Posey had two more singles and finished the series 8 for 12 to raise his average from .251 to .274. In the third, Duffy later scored on Milwaukee's second throwing error of the inning to make it 4-0. The Giants added on a four-run fourth, too, highlighted by Angel Pagan's run-scoring double and RBI singles from Joe Panik and Jarrett Parker. Gregor Blanco, Duffy, Pagan and Panik all had three hits as the Giants wrapped up their homestand with an 11th victory in the last 13 games at AT&T Park. After a leadoff single to Jonathan Villar, Cueto still faced the minimum through three with Villar getting caught stealing. Cueto became the 13th pitcher to win as many as eight straight against Milwaukee in the club's history. The Giants earned their fifth sweep this season and third of the Brewers in the last six years. Alex Presley hit an RBI single in the fifth as Milwaukee avoided a shutout. Nelson, who lost to the Giants on April 5, allowed eight runs to match a career high. The right-hander failed to pitch past the fourth inning for the first time this season.